MOVIMOT® is the proven and ingeniously simple combination of a gearmotor and a digital frequency inverter in the power range of 0.37 to 4.0 kW. Despite the integrated frequency inverter, MOVIMOT® requires only slightly more installation space than standard gearmotors and can, of course, be supplied in all standard versions and mounting positions, with and without a brake, for supply voltages of 380 to 500 V and 200 to 240 V.
NEU: MOVIMOT® of series D can be combined with the new DR motor series in diverse efficiency versions as standard. 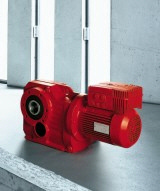 Purchase your SEW Eurodrive MOVIMOT Gearmotor and Frequency Inverter today!